This winter I decided to finally do something about the ratty lining in my good winter coat. This coat is 100% wool, very well made, fits me really well with my short stature, but the lining is toast after many years of use. It is worn thin in areas, pulled apart at seams, has a tear in the back, and been repaired multiple times. The outside is still in great condition, so I purchased a quality lining fabric, and took it to two seamstresses in town as I didn’t think I wanted to mess with it. But, turns out, they didn’t either. So, what the hay, if I want it done, I’ll just have to do it myself. Good thing I can sew! 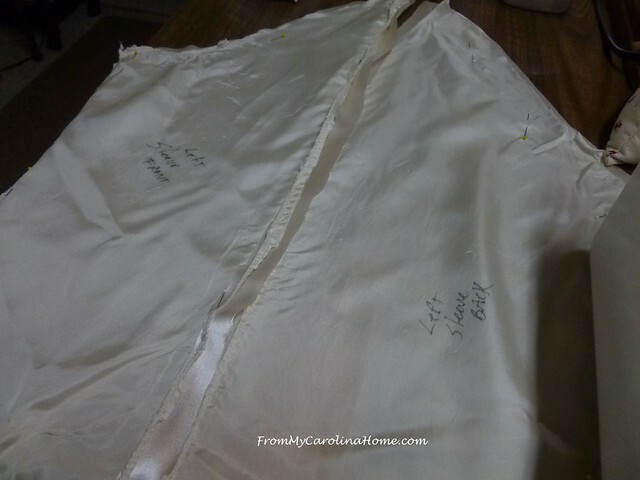 Today, I’ll show you how to construct the new lining, and next time, we’ll put it in. Begin by carefully removing the lining from the outer shell. 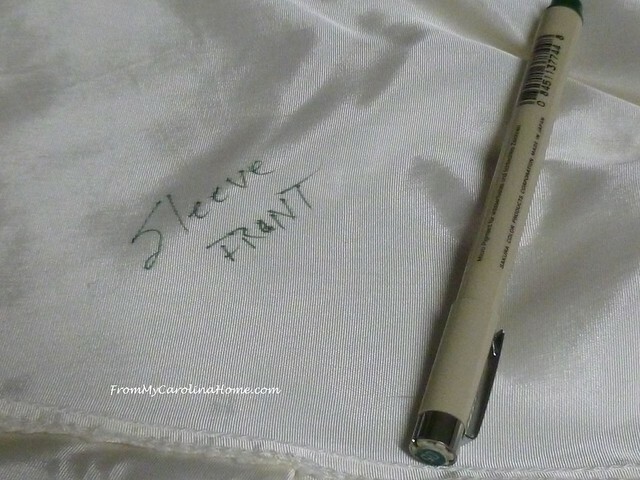 Mark lining pieces in permanent marker noting left and right sleeves, center back left and right. I added the left and right after I took the photos and forgot to reshoot them, but you get the idea. Cut lining apart at the seams, removing previous repairs if any to keep the lines of the piece straight. Note darts, pleats and tack points. Press the pieces flat as you can to make it easier to get a proper new piece cut. 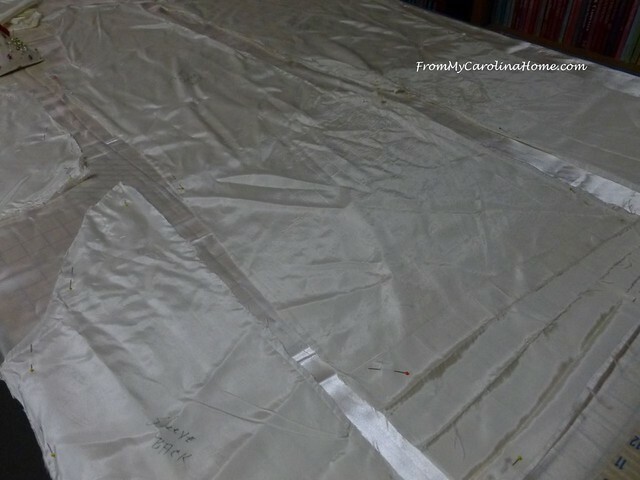 Lay new lining on the cutting table in a single layer right side up. Pin the old lining pieces also right side up to the new lining fabric. 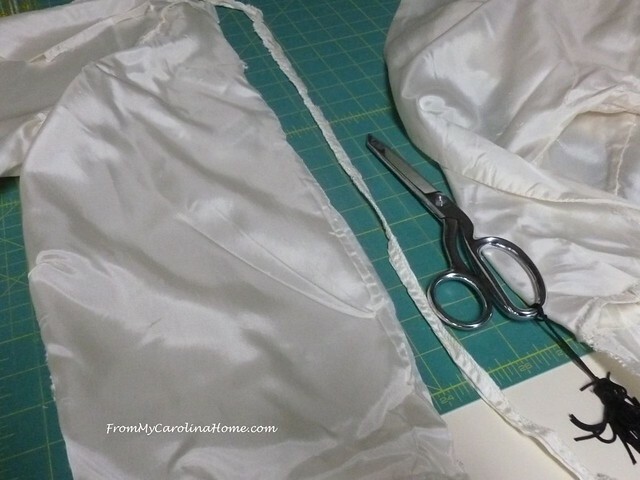 Lining fabric is very easily distorted, so be sure no tension is on any part while cutting. 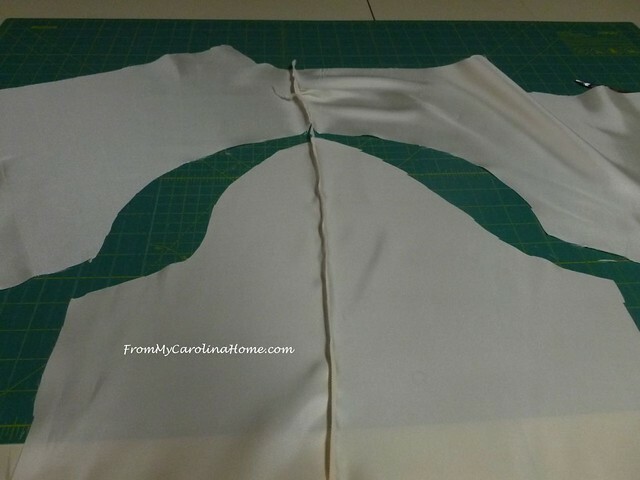 For example, if the edge of fabric is hanging off the cutting table, it can pull on the fabric on top as you are cutting, distorting the piece. Cut out pieces. 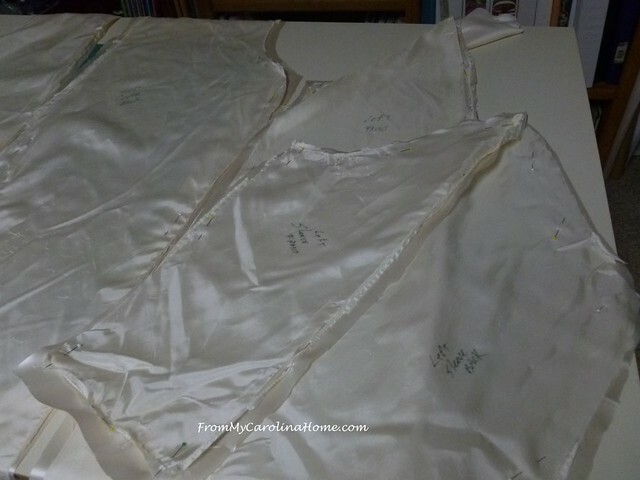 For my coat lining, I have 8 – 2 sleeve fronts, 2 sleeve backs, 2 front panels and 2 back panels. 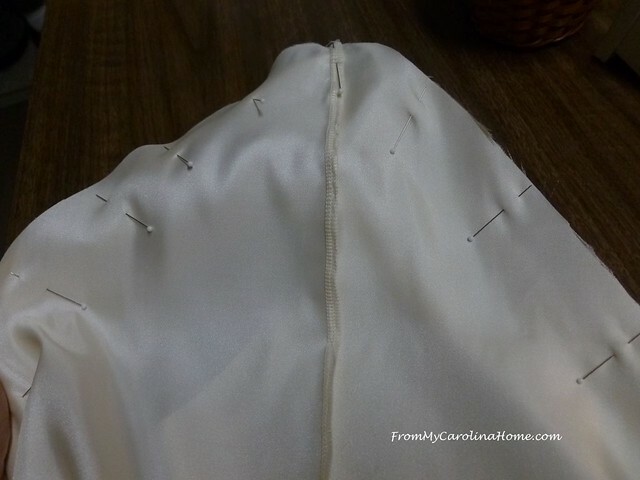 Sew left sleeve pieces together at the top seam. Sew left front to left back at the shoulder. 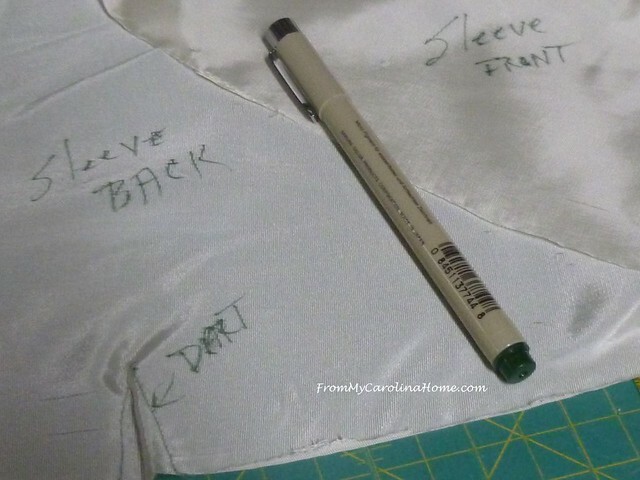 Pin sleeve into left side and sew the two sections right sides together. 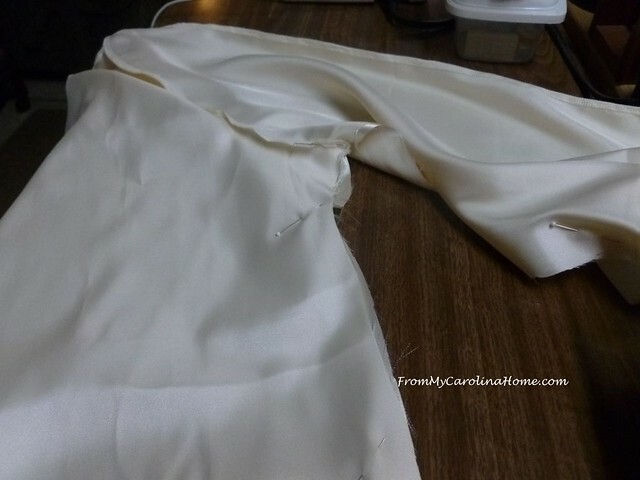 Then fold the section right sides together to sew underside sleeve seam and side seam in one continuous seam. I used my serger for the lining construction, as it eliminates the raveling that can occur with satiny fabrics. 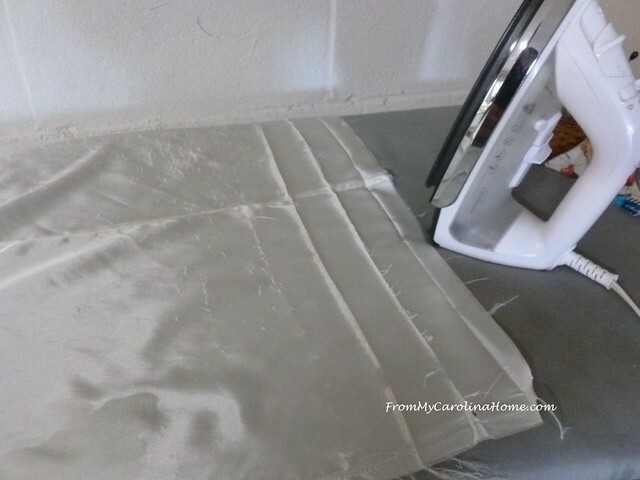 If you don’t have a serger, just use your domestic machine and when the lining is fully constructed, you may want to zigzag the edges to prevent raveling. Construct right side in the same manner. 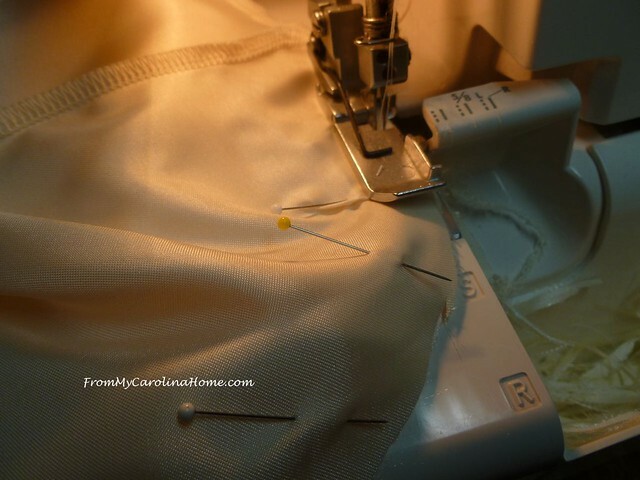 Place right sides together and sew center back seam. I didn’t get a picture of the new lining all done, as I went directly to inserting it into the coat and forgot. But I think you have the idea. Next time, I’ll show you how to insert it and finish it so no one will guess that you did it yourself! Have you ever attempted a big project like this? See part two for the finishing Relining a Winter Coat Finishing. Bravissima👍 Io invece sono incapace 😔 Buon inizio settimana! I am very surprised that two seamstresses turned down the job. It is nice to have a coat that you really like. Great job! 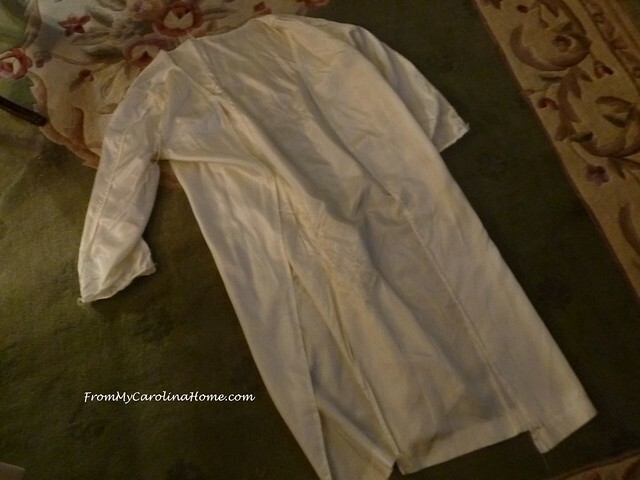 There is something so satisfying about restoring some favorite garment like that to its original condition (or repurposing, which I also enjoy!). Good for you Carole! 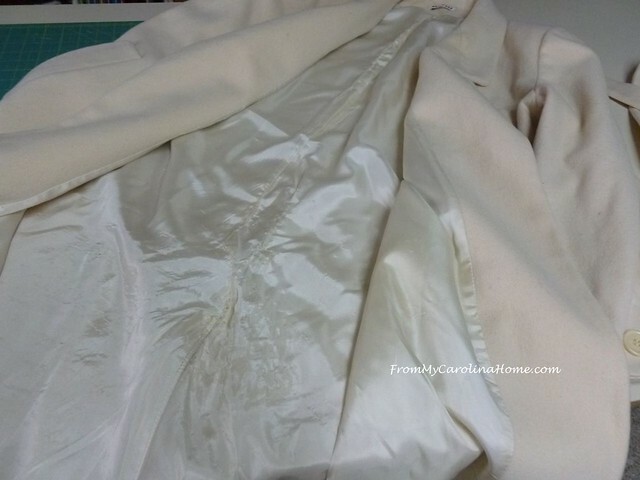 I am surprised at those seamstresses, replacing a lining in a dress coat is really easy. Now a ski type jacket, not so much! I had to replace Girl#1’s lining twice, before she wore out her coat (those darn, heavy backpacks) When she moved to Montana from Missouri she only had a ski jacket so I had to make her another double quick, so she had something for dress/professional wear. Your lining is looking textbook, you’ll get tired of the coat before you have to replace it again!! Hat’s off to you, Carole, for tackling and mastering such a big job. My sweet Mama replaced the lining in my hubby’s sport coat many years ago, because iI was too intimidated :). Your step-by-step instructions are very reassuring and I may be tempted to try one if it ever comes up again. Sometimes it just takes determination, patience and persistence! Bravo to you! 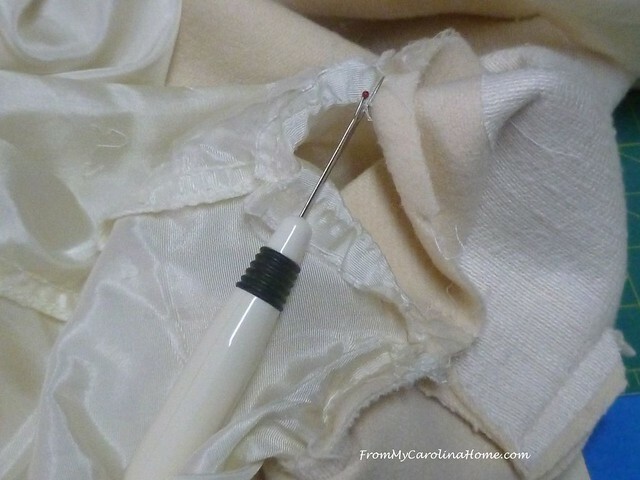 Ah, fond memories of garment sewing days! So smart to use the old lining as the template. That way you know it will fit! Hello Carole, Wowsers! Way to go on a great project. You will never run out of ways to teach me (and anyone else that wants to learn) and encourage me to reach out and try new projects. Although, I do not have any type of sewing projects like this at least I know who to contact to help me and also to read this post again! I am late replying and am on my way to the next post, so no need to reply to this comment. Talk to you on the next post!